Western blot analysis of whole cell lysates probed with COMMD1 antibody (VMA00146) followed by detection with HRP conjugated Goat anti Mouse IgG (1/10,000, STAR207P) and visualized on the ChemiDoc™ MP with 60 second exposure. Arrow points to COMMD1 (molecular weight 21 kDa). COMMD1 antibody recognizes the COMM domain-containing protein 1, also known as MURR1. The antibody has been extensively validated for western blotting using whole cell lysates. Mouse anti Human COMMD1 antibody recognizes COMMD1, also known as COMM domain-containing protein 1, copper metabolism gene MURR1 and protein Murr1. COMMD1 is a regulator of copper homeostasis, sodium uptake, and NF-kappa-B signaling (de Bie et al. 2005). 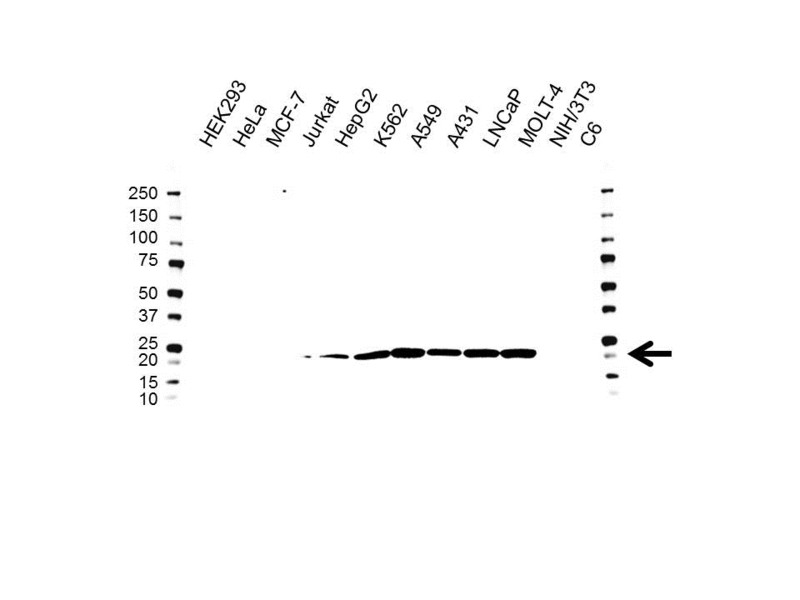 Mouse anti Human COMMD1 antibody detects a band of 21 kDa. The antibody has been extensively validated for western blotting using whole cell lysates. Anti COMMD1 detects a band of approximately 21 kDa in K562 cell lysates. de Bie P et al. (2005) The many faces of the copper metabolism protein MURR1/COMMD1. J Hered. 96 (7): 803-11.